If you are planning to attend any of these, do book a hotel well in advance. ​Epernay, the capital of Champagne, celebrates three glorious days of events, drinks and food along the famous Avenue de Champagne. There are extraordinary installations in the streets, an exhibition of vintage cars; street theater; son et lumiere and music. Each day has different offerings but there is one thing that remains the same. Many of the major Champagne houses along the Avenue de Champagne are open to the public, with Champagne bars, illuminations and tastings. The Festival also has a spectacular fireworks display. In 2017, the dates are Friday December 8th to Sunday 10th. Read more about the Habits de Lumiere here. 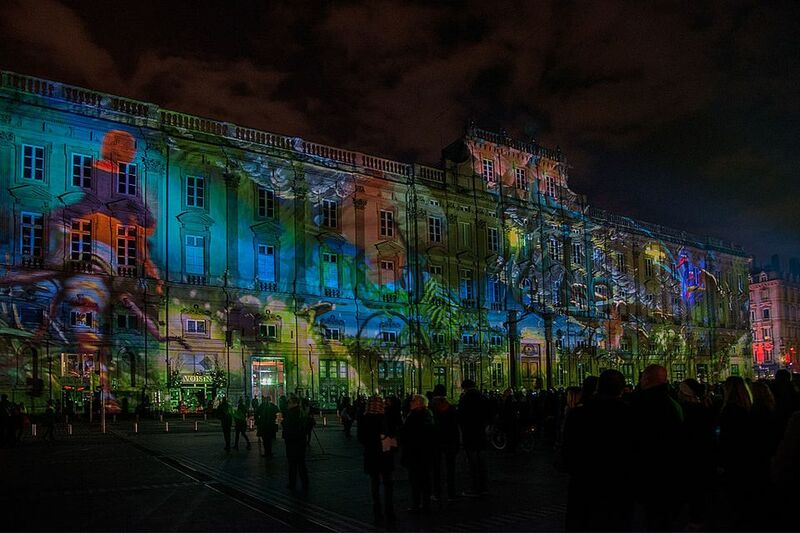 This is the time of year when Europe flocks to the famous Festival of Light in Lyon. The city is magically illuminated, but often not as you would expect. The city becomes a stage set, a place of weird images and strange perspectives.The festival dates back to December 8th, 1852, when the good residents of Lyon put candles on their windows and balconies to mark the installation of a new golden statue of the Virgin Mary on the Fourviere hill that dominates the city. There are different routes you can follow, with different themes from a family walk to one around the main buildings of the city. More on the Lyon Tourist Office website. Since medieval times, the Fêtes de Saint Nicolas (Saint Nicolas Festivals) have filled the streets of Nancy on the first weekend of December. The festival celebrates St. Nicolas Day on December 6th when the legend goes, three children got lost…were seized by an evil butcher…and finally rescued by St Nicolas. The celebrations take place in every large town and small village with the children receiving gingerbread and small gifts. The biggest celebration is in Nancy, the capital of the Dukes of Lorraine, with a weekend of events attended by thousands of people. This year, 2017, it's on December 2nd and 3rd. Check out the information on the Nancy Tourism website. You don't expect a music festival in December, but this is Rennes in Brittany, a region which has always gone a different way from the rest of France. It's the place for experimental music and the place to discover...perhaps...the great new faces of the international music scene. It's also great fun and a good way to kick off the holiday season. This year it takes place from December 6th to 10th. Read guest reviews, compare prices and book a hotel in Rennes on TripAdvisor. France sparkles like a huge Christmas tree throughout December with the light displays that transform many of the major cities. The French are extremely good both at lighting and at light installations, and you'll see some spectacular sights. Check with the local tourist office in the town you are visiting in advance. France is a great place for Christmas markets. Some start in the last week in November; others wait until December. From large cities like Lille and Strasbourg, to small towns like Castres in the Tarn and Le Puy-en-Velay in the Auvergne, the streets sparkle with lights and stalls line the squares selling one-off wooden toys, local produce, sweets, food, gingerbread, Christmas decorations and more. New Year's Eve, December 31st, is big news in France and you need to book a restaurant way in advance, particularly in the big cities. All restaurants, even the smallest ones in little villages, will serve a special menu, often very expensive ones. But dining on New Year’s Eve is a big public event, with everybody joining in the celebrations.